On Friday morning Meg and I headed out to capture our Apple Fest adventure for your fine faces. Attending Apple Fest used to be a yearly tradition for me (until I broke up with the boyfriend I first went to Apple Fest with and then it was like one of those things that you tell yourself you can have just for yourself now! but then you go and you’re like, “Whoa, so many memories, why didn’t I just lock myself into a room decorated with photos of his face and a constant loop of our song playing over and over instead? !” and so it was just too painful to go back after that and HEY STOP ASKING ME SO MANY QUESTIONS ABOUT IT ALREADY) and Meg hadn’t been to an Apple Fest for years, so we were pretty damn excited to make an Inaugural Girl from the Northwoods Pilgrimage to this annual autumn event. Starting out the day at Delta Diner – because as every self-respecting girl from the Northwoods knows, you can’t have a full day without a full breakfast – we stuffed our faces with the Stuffed French Toast (me) and the Lucky Denny (Meg) while we talked about our agenda for the day. The one thing I have never actually done on all of my Apple Fest jaunts is actually visit an apple orchard. So we decided to remedy that glaring mistake by visiting a few choice orchards before hitting up the street fest. The highlight of our orchard hopping was Hauser’s Superior View Farm: A beautiful orchard that boasts a gorgeous view of Lake Superior (accessed from a looking point at the top of the barn) it’s wooded acres and sprawling grounds quickly showed to be a favorite among Apple Fest goers. We took ourselves over to the wine tasting tent to meet with Scott Hauser, who took us through a rousing and entertaining wine tasting of Bayfield Winery selections. 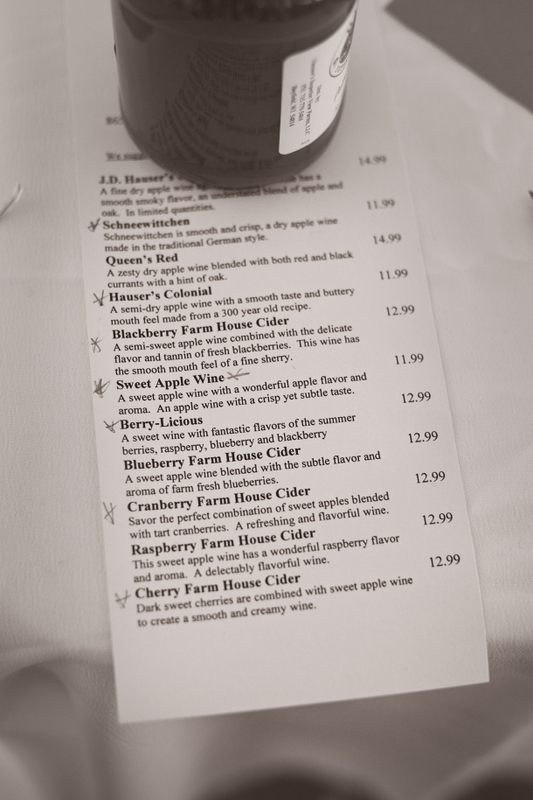 Almost all of the wines offered by Bayfield Winery are made with apples, with a large number combining apples with other orchard produce such as blackberries, raspberries, blueberries, and cranberries, some featuring hints of oak and currants. While I loved J.D. Hauser’s Grand Reserve (“A fine dry apple wine…aged in oak with a smooth smoky flavor, an understated blend of apple and oak”), Hauser’s Colonial (Scott told us that Jefferson would drink a glass of this semi-dry apple wine – it’s a 300 year old recipe – every morning with breakfast. So it’s not only delicious, but it also gives you permission to have wine with breakfast as a historically-important act of respect and reverence for our forefathers), the Cranberry Farm House Cider (a combination of sweet apples blended with tart cranberries, Scott told us that this was a perfect wine to have with Thanksgiving dinner! ), and Meg dug the Berry-Licious (“a sweet wine with fantastic flavors of the summer berries, raspberry, blueberry, and blackberry”), the Sweet Apple Wine was a standout favorite for both of us. 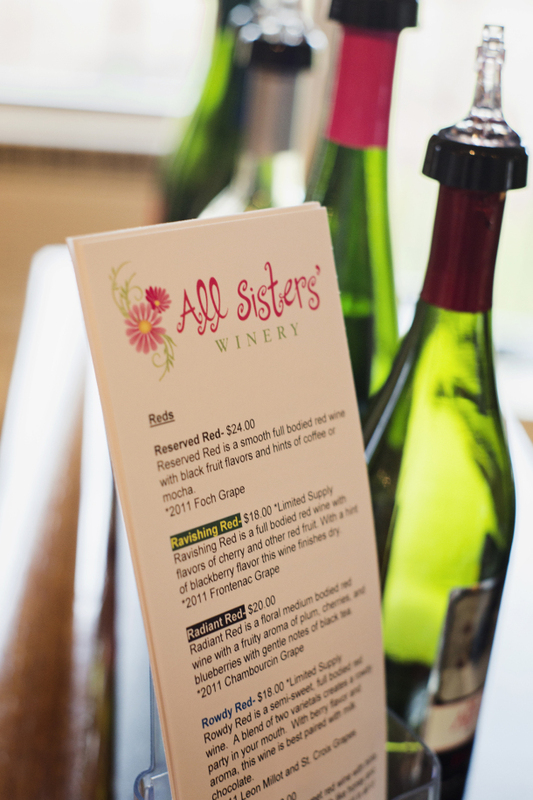 During the wine tasting, Scott encouraged us to visit All Sister’s Winery. At first we were like, “Uh, thanks but no thanks, Scott. Do we look like the kind of girls who want to spend all day drinking wine? !” He was like, “Yeah, kinda.” After learning it was just down the road, we told him that we would at least think about checking it out, and then – when we were sure he couldn’t see us anymore – we ran the rest of the way to our car and raced over there. My mom has been to All Sisters before and has raved about it, so I was pretty excited to see it for myself. We were greeted by Caitlin Hauser, who led us through a tasting of the All Sisters offerings. “It tastes like a forest fire,” Meg quipped at one point, after tasting the Witty & Wild. And it did. Mainly because forest fires TASTE AWESOME. After going through the tasting and then buying out the place (Christmas is just a mere 60+ days away! ), we finally headed to Bayfield for the street fest. While driving into town, I told Meg about the big flood in 1942 and subsequent landslide that culminated in dead bodies being washed away from their graves in the Bayfield cemetery, including a man who had been buried wearing nothing but a green tie (as chronicled in the excellent Badger Boneyards by Dennis McCann). This is always a great story to tell anyone who is preparing to spend a day in Bayfield, and I highly recommend you heighten your own friend’s Bayfield’s experiences with it. Our first stop was Morty’s Pub, where we freshened up from our rigorous morning of wine tasting, and then sidled up to the bar to warm up with some spiked mulled cider and an apple pie shot. The apple pie shots were like having the entire Apple Festival break out into a dance party in your mouth (and that’s coming from someone who doesn’t even like shots). You can make your own at home with Sour Apple Pucker and Butterscotch Schnapps! After warming up a bit (it was a rather brisk and windy day…weird, right, since it was October and we were on the shores of Lake Superior…) we decided to stroll down to the water to check out the arts and crafts booths. I have to say this: One of the reasons why I love the Apple Fest so much is that, even though I’m not a big arts-and-crafts-fair type girl, even I can tell that Apple Fest’s arts and crafts vendors are top-notch. Though it was so windy down by the water that we felt like we were literally going to be picked up and pitched into the Superior, we highly enjoyed the collection of artists, metal and wood workers, jewelers, and photographers gathered at the park. For lunch we headed into the Lounge at the Bayfield Inn, where we were encouraged by fellow patrons to try the Lake Superior White Fish Tacos and Bloody Mary special. Again, it took a lot of convincing – drinking at lunch on a Friday day off?! Fine, but only for research – but once we relented….oh wow, my friends. I’ve had a lot of fish tacos. I’ve had a lot of Bloody Marys. And both were pretty freaking amazing. I have it on good authority that this special isn’t just for Apple Fest weekend, so on your next trip up to Bayfield, stop in at the Lounge and see if it’s available. You’ll thank me for it. After lunch, we walked around a bit more, browsed at some of the shops, and then headed into the Big Water Coffee Roasters for a little afternoon pick-me-up. We’ve been planning on doing a full-fledged Northwoods Spotlight on this fantastic roastery for months now, and that sense of urgency was only heightened by our visit on Friday. For geeks like Meg and I who are totally into stuff like that, their branding? Fan-freaking-TASTIC. The newish male barista wasn’t too rough on the eyes, either. Aaaaand – I am totally not exaggerating here – I had pretty much the most amazing Pumpkin Spice Latte there that I have ever had in my life. And if you think I know about fish tacos and Bloody Marys? (hint: I do) That’s nothing compared to my love for and expertise in regards to Pumpkin Spice Lattes. We’re getting to know each other so well with this post! I feel so close to you guys right now. If we would have thought ahead, Meg and I would have had made a plan to try all the different foods from the Apple Fest vendors and take pictures and rate them all for you, but instead we were totally selfish and got waaaay too full on wine, bloody marys, fish tacos, and pumpkin spice lattes to do that. We *did* pop into a store that advertised free samples of pumpkin pie fudge, but when we went in? There weren’t ANY free samples, much less samples of pumpkin pie fudge. Which means they were doing false advertising just to get people like me who love pumpkin pie into their store, and then they cruelly dash our hopes for pumpkin pie fudge amazingness against the rocky shores of “HAHAHA, TRICKED YOU.” I will never go in there again. If anyone asks why, just point them to this incredibly irrational portion of this post. So instead of doing our jobs as crackerjack reporters who help you to make your Apple Fest experience its memorable best, we were just selfish and wandered around to different shops and took ridic pictures of ourselves around town. We’re gonna get better at this whole “Let’s go do a thing and then write about it for other people!” stuff, you guys. I swear it. To round off the day, we decided to hit the library book sale, and on the way there we ran into Hannah Stonehouse Hudson of John & Shep on Lake Superior fame. Out walking her dogs, Meg chatted with her a bit but played it cool, deciding not gush to her face about how cool she was and how much she admired her work, and instead we decided to just gush about it to each other as we were walking down the library stairs to the book sale. All in all, it was a fantastic day at the Bayfield Apple Fest, and spending Friday there just made us want to get up there again and again to do more features on all the great places and things to be found and enjoyed in one of our favorite Northwoods towns. 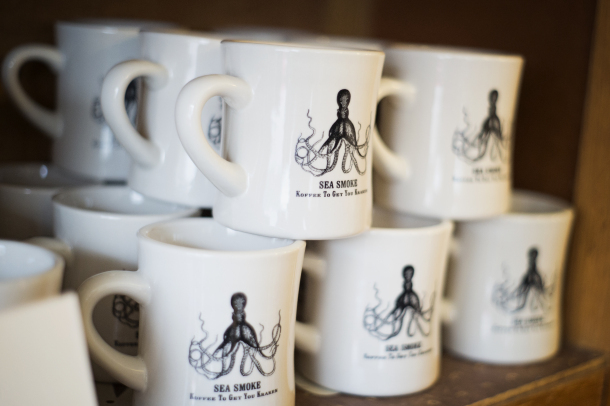 Until next time, Bayfield…your pumpkins spice lattes will be in our dreams.